Hello there, you probably have the GoTV multichoice decoder and have been struggling with how to get it activated as fast as possible after payment? The fastest way to get your decoder activated has been discovered and that is what we will be looking at today on electronics. By getting it activated, I mean clearing gotv error code. If you have been using Dstv you could get back online within minutes but this really depends on how you made your payment. It is not so with Gotv as you need to clear the error code manually especially for those of us who like making payments online. Getting your decoder reactivated as fast as 4 – 5 minutes is not some huge tech trick; it’s just a simple avenue a lot of us “home owners” ignore because we probably do not have the time or just don’t think it will help us deal with an error code. GOtv users who come across the E16 error code are mostly the ones who fail to upgrade their bouquet before expiry. Nonetheless, there are instances where you still come across the E16 even after upgrading you bouquet before expiry. This often occurs primarily because the upgrade has not been processed: simply put, your decoder has not been reactivated after payment. To save yourself from the stress of applying for reactivation, it is advisable to upgrade your bouquet before the previous subscription expires. However, gotv error codes have a way of appearing so let's see how to clear them on GOtv. First of all you have to know the kind of error code you want to clear. There are two types of error codes you will come across while using Go Tv or let’s say the ones I have dealt with while using this product from multichoice. There is the E16 error code that shows up and can be really annoying when you are trying to access your favourite channel on a very boring day. When you see the E16 error, you do not need “google search” to tell you that your subscription has expired. There are two, three or even more ways of clearing error codes. You could send RESET + IUC Number to GOtv short code. The GOtv short code for those living in Nigeria is 4688. For those living in Kenya, the sms short code is 22688. You could also call them or visit the nearest GOtv multichoice center near you. There are even more option if you do a google search. But check out how to get back online once you receive payment notification; especially for those of us who love making payments online using a debit or credit card. 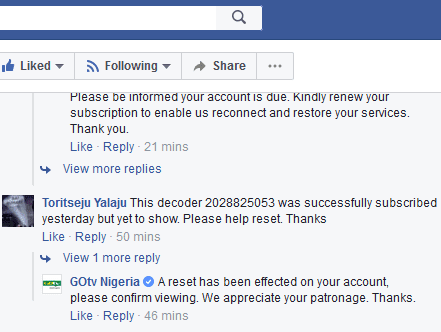 The quickest method you could use when trying to get back online is making use of the GoTV Facebook page. You have probably tried that but it did not work out right? Well that is because this method also has limitations. The Gotv facebook page used here is for just one country. To find Gotv facebook page for all Gotv countries, please see the Article on How to reach gotv customer care via Social Media. They might not respond to queries 24 hours a day and personally I wouldn’t try to get things like payment and activation done during the weekend. This is probably the worst time you could use for payment and reactivation. But you could always try Saturday though. This method really works during working hours (on working days): from around 8:00 AM to 6:00 PM (CAT). After making payment, visit the GOtv Facebook page. Find the latest post made by GOtv - a post on anything. This is not difficult to find. It is will be the first post you will find on the page. Although an old post can be “pinned to top” on a Facebook page, Go TV does not “pin to top” and even if they do, you will get response to any comment you make on the post. When you find the latest post (or active) post, post a comment; something like “Activate my decoder, IUC – 4601xxx921.” Wait for about five or ten minutes and you will get a response to your comment telling you that your decoder has been activated. Make sure your decoder is switched on so it can receive commands. That’s it! Quick and easy. The other kind of gotv error code you will find is the E32 or E48-32 error code. This shows up to notify you of a signal problem. IF you find this error code on gotv, then you have to do some manual work to clear it. The e48-32 error code could also appear due to adverse weather conditions. What you can do to clear the e48-32 error code is to reset your decoder. If this does not work, check to see if your antenna is well positioned (that is, if it is still at the normal position). If the gotv antenna is not well positioned, correct it. Check to see if it is blocked by some new structure. If it is blocked, look for another position for it or use a rod to increase the “height” of the antenna. There are others ways of clearing E16 and E30 error codes on gotv. You can do this using the gotv sms short code method. You can find the gotv sms short code for your country below. You can also clear error code by visiting the gotv WhatsApp group. Visit this link - https://chat.whatsapp.com/CBKNbqOtvmbLFwHDub4lRd with your smartphone to join. You can also request for the expiry date of your gotv subscription in the WhatsApp group after joining this link. The following will show you how to use short codes when clearing E16 and E30 error codes. The E16 error code indicates that you have been disconnected for not paying your subscription or upgrading your decoder before expiry. The E30 gotv error code indicates that you you have probably been switched off or without signal for too long. Both error codes can be cleared using SMS. Those are the gotv sms short codes for African countries using Go tv. If your country is not listed above please use the contact box or the comment session to let us know. We will add your country to the list with the needed short code. That should solve the problem. Also, if you encounter any problem with your gotv, please use the comment session. This is helpful!!! Thanks for the post. You need to contact gotv for them to help you clear that. But often it means that channel is not available for the package you are using. Unfortunately GOtv's customer service is no longer responding to messages the way they did before. Please visit the nearest (Multichoice) GOtv office near you to clear your error code and reactivate your suspended account.